The beautiful warm climate means it's possible to enjoy a much greater range of activities without having to endure chilly and uncomfortable conditions. Marbella has a sweeping coastline stretching 17 miles of coastline with an impressive 24 beaches offering soft golden sands and frothy surf. Pristine and clean, the beaches in Marbella are popular all year round with both sun worshippers and water sports enthusiasts. Thanks to the accommodating conditions, there are a huge range of watersports which can be enjoyed in and around Marbella; here's a snapshot of just some of those that you could try. Far trickier than it looks, jet skiing is an exhilarating watersport which provides participants with the chance to experience moving through the water at high speed without being inside a boat. Jet skiing looks as if it requires no more than the ability to stand, but moving to an upright position and holding it for the duration of the time out on the water takes a surprising amount of skill. Nevertheless, the good news is that it's a knack that can easily be mastered with a bit of practice and where better to do this than in Marbella? It doesn't matter if you have never been jet skiing before as you can have lessons to master the art and learn all the insider tips and tricks. As well as the beautiful waves of the sea, there's a large lake, entirely natural, in Guadalmina which is perfect for this kind of activity. There's an activity centre at the lake so for those not taking part, there's a terrace whether you can watch others whilst relaxing over a drink and some tapas. It may sound like a sci-fi fantasy but if you've always wanted to try out a jet pack that gives you the ability to hover in the air, now's your chance. Jet propelled flying uses water to power the system, sucking up water and pouring it back out again to gain the lift required to really fly. The back packs are capable of lifting anyone weighing up to 330lbs and between the heights of 4 feet and 6 foot 6 inches. Once in the air, you'll be able to hover, turn, fly and dive and you'll be taught how to do each of these by a qualified instructor. The jet packs aren't recommended for young children as a top speed of 35mph is possible, and heights of 32 feet can be reached. Despite this, the water nozzle propulsion system is incredibly easy to operate and it won't take long before you're whizzing around in the air, with a stream of water jetting out from either side of your back pack. The exact design of the fly pack varies slightly depending on which company you hire your equipment from, but a general description is that you'll be looking like Ironman - minus the metal suit - once you're up in the air! If it's the ocean waters that you really crave, kite surfing could be the sport for you. It's possible to hire equipment as well as have lessons, so whether you're a beginner or a more experienced waterspouts fanatic, there's no reason why you can't have a go. Kitesurfing allows the participant to move across the water while standing on a board, similar to a small surfboard. Attached to this is a kite, which looks just like a small parachute which harnesses the power of the wind to propel the board. No waves are needed to get moving as the board relies entirely on the wind for propulsion; it's therefore necessary to have a bit of a breeze to get the most out of the experience. Experienced kite surfers prefer water which is as flat as possible as it provides them with a stable surface to take off from to do tricks and perform stunts. The size and shape of the "kite" varies depending on the size, strength and experience of the surfer whilst larger boards are used for beginners as they're easier to get moving. A type of watersports which has really rocketed in popularity in recent years, kitesurfing has some crossover with other activities such as windsurfing, snowboarding, surfing and paragliding. If you've ever done any of these sports before you will find kitesurfing even easier to pick up. One of the more popular ocean-front sports, kite surfing can be enjoyed in Marbella with the beautiful clear ocean the perfect place to try it out. A sport which was originally designed for use by the military rather than as a leisure activity, parasailing has been around for several decades. A common waterspout found on holidays, Marbella's beautiful landscape provides the perfect backdrop for parasailing, affording participants a view from the air. Parasailing involves one or two individuals being attached to the back of a speedboat to a parachute which then soars high into the air once the vessel starts to move. Each trip can tropically last up to 15 minutes and it's a very calm and tranquil experience, even during take-off and landing. With parasailing you embark and land from the boat itself so you don't need to get wet which means you can either wear your swimming costume or a pair of shorts, T-shirt and flip-flops - whatever you're most comfortable in! The law prevents you being allowed to travel more than 500 feet in the air, directly upwards, and you'll also find operators have weight restrictions, both minimum and maximum. Some will allow children to go parasailing as long as they are accompanied by their parents. A bit of wild and wet fun suitable for the whole family, banana boating doesn't require any technique, skill or previous experience and is suitable for both adults and children. The way it works is very simple: a large inflatable banana, typically seating around six people, is hauled across the water by a speed boat. This motion sends the inflatable bouncing off every wave, which means that everyone has to hang on tight! Each ride is typically finished with sharp turn by the person driving the speedboat which throws everyone from the banana boat unceremoniously into the water. 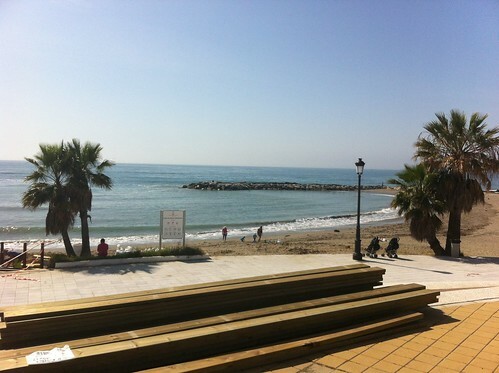 It's possible to find banana boating at several locations along the front of Marbella's coastline. A traditional water sports activity, it's possible to get out onto the ocean on a pedal boat. Pedal boats can be used either solo or have the whole family on board, and are a simple and low-octane way to enjoy being on the water. The waters of the Mediterranean surrounding Marbella are full of spectacular marine life and what better way to see this than to get in the sea alongside them? 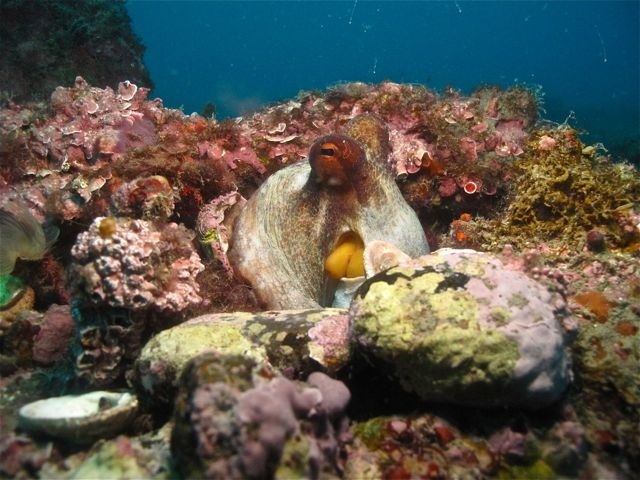 Snorkeling is a great way to start, allowing you a view beneath the surface but to really experience the underwater world, scuba diving is the best option. You'll need to have undergone the basic training before you can go exploring, but there's plenty of diving schools around Marbella who can provide the necessary lessons. If you want to explore the coastline, a kayak is one of the most comfortable ways to do this, allowing you to feel like you're in touch with nature whilst remaining safe. You don't need to super fit to go kayaking, and the whole experience is vastly different to the kinds of white-water rafting you may be imagining. Ocean kayaking is a calm and tranquil affair, and provides you with the opportunity to paddle around the coves, exploring all the nooks and crannies without disturbing the wildlife with a motor boat. In a kayak you can visit remote beauty spots along the coastline, check out tiny sea caves inaccessible by foot and get away from the crowds on the beach. Sea kayaks are typically shaped differently to white-water rafts too, being much longer in the base, and therefore providing a far more stable unit which is much less likely to overturn. You won't be permitted to simply rent a boat and head out as it's important to understand the dangers of the water, and how to interpret the conditions. However, kayaking is one of the quickest and easiest watersports to pick up, which means you will be able to hit the water unaccompanied sooner rather than later. If you're keen to get out on the water but don't want anything too energetic, you might want to try out one of the dolphin-watching trips. 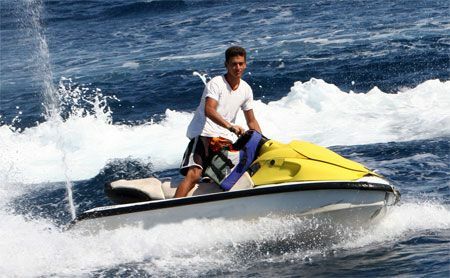 Not technically a watersport per se, it nevertheless can be a great way to enjoy the ocean waves even if you aren't able to participate in other activities. As well as the opportunity to see wild dolphins just off the coast of Marbella, you could also glimpse whales, flying fish, graceful tuna and turtles. This excursion is a great way to see some of the natural wildlife that inhabits the ocean and marvel at the breathtaking coastline around Marbella. 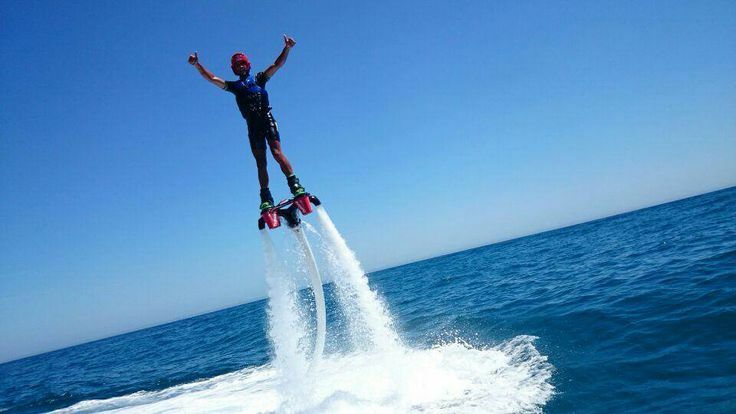 No matter where you are staying in Marbella waterspouts activities are within easy reach. With such an expansive coastline and a myriad of beaches, there's plenty on offer wherever you go.